We established 3G Proxy as the “go to tool” for testing user flows, analyzing competition, running compliance tests or checking fraud advertising by using mobile carriers around the world. Most of our clients test their products and services through our easy to use web interface or the Chrome- and Firefox-Plugins. By developing our product further and adding new opportunities for our clients – we are happy now to introduce the 3G Proxy API! But first of all – what is an API and why did we develop it at 3G Proxy? An API stands for Application Programming Interface. It allows developers (or software systems) to access the functionality of software or hardware modules through well-defined data structures. By integrating the 3G Proxy API, it is possible to get access to our worldwide network of 3G/4G modems and to get own mobile IP’s. Which customers benefit most from an API? The 3G Proxy API benefits customers from the Ad or Affiliate Industries who do automated testing and have big data usage (above 10 GB/month). Especially for companies that offer Ad Verification or Ad Spying systems, an API integration benefits their business. 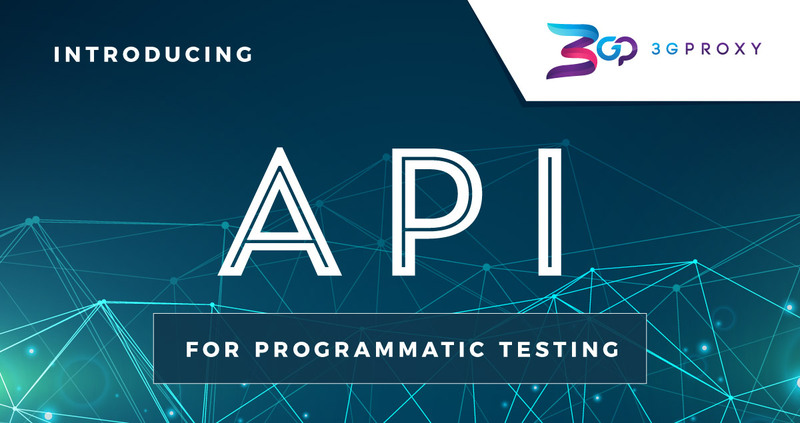 Using the 3G Proxy API makes programmatic testing easy as never before! Partners can integrate the API into own systems and target ads and landing pages using a 3G connection with various mobile carriers of their choice. Therefore, they can distinguish themselves from competitors and offer additional functions to their own customers. How is the integration done? The use of our well documented API is very easy. The integration of 3G Proxy and direct access to our worldwide distributed SIM cards into third-party systems of our clients is done within few hours. The automated testing of Fraudulent Advertising or for Ad Spying purposes by our business clients can start at the same day. If you are interested in our API – our project managers and developers can provide you with the documentation. Just contact us and let’s have a call!